nurse in a rural agency in the Florida Keys. 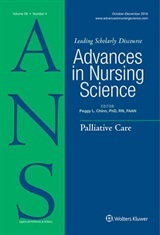 I wanted to explicate the barriers to Advance Care Planning (ACP) to understand why their rates are so low despite the fact that the literature suggests that ACP may reduce some of the unnecessary suffering that I had witnessed in many of my dying patients. Moreover, I felt frustrated by the “death panel” rhetoric that emerged during the 2008 election that served as a vehicle to oppose the Affordable Care Act (ACA). Even in 2014 the politicization of end of life (EOL) care persisted and served to marginalize individuals during one of the most vulnerable times in life: while dying. Therefore, Habermas’s Theory of Communicative Action (Critical Social Theory) was an ideal lens to evaluate the historical, political, social, and economic context that serve as barriers to ACP. With the help of my faculty mentor, we have brought forth this manuscript to publication in hopes of starting a national conversation to facilitate an open dialogue about how our American society approaches death. Little did we know at that time, this article would be published during another equally contentious election year. Thus, the need to illustrate the importance of ACP and the influence of societies taken-for-granted assumptions are as relevant today as they were back in 2008. President-elect Donald Trump has not put forth a replacement plan for the ACA but he and his administration have prioritized the repeal of the ACA. At this point it is anyone’s guess how healthcare will change and what that will mean for EOL care. Therefore, in the spirit of this manuscript, it seems important to present some timely topics in addition to those raised within our manuscript for discussion as the nation contemplates how we will move forward. We hope that you take the time to read our analysis and that you utilize this blog as an opportunity to participate in the national conversation by adding your own thoughts and ideas. Will history repeat itself if the ACA is repealed and will we go back to the prior health delivery system in the United States or will this be an opportunity to revamp the ACA into a model that meets the needs of all Americans—especially those at the EOL? Looking ahead, will ACP & EOL care be prioritized in this new administration? How will vacancies on the supreme court be filled and what impact will they have on EOL care or the right to die? Discussions of “Death Panels” persist (Frankford, 2015). How can American society reconcile the EOL in a way that we can all agree upon? Respecting Diversity is critical to the formation of an ACP. How do we balance what is best for the individual with what is best for society as a whole? What is the role of religious & cultural beliefs in EOL care at the individual and societal level? With immigration reform as a high priority within the Trump administration what does this mean for families and their social support systems? What are the economic Implications of repealing the ACA? For example, President-elect Trump has proposed a hold on Medicaid expansion and Medicaid monies may be allocated to the states (Pear, R., 2016, November 15)—how will this impact health coverage and ACP and can states do a better job? Frankford, D. M. (2015). Behind the jargon: The remarkable staying power of “Death Panels.” Journal of Health Politics, Policy and Law. 40(5), 1087-1101. Dr Sadie Hutson is PI on a recently completed mixed methods study of EOL and ACP needs of people who are living with HIV/AIDS in Appalachia. We found that nearly all suffer stigma (HIV itself is stigmatized)–there are often multiple sources, as in Crenshaw’s Intersectionality framework. If pts are LGBTQA+ and POC,and female, and low-income__this is a devastating social burden. Often there is family ejection, or so much secrecy in the face of that potential rejection, that ACP with dialogue among family members s a minefield. We found that while most would like to die at home, in rural Appalachian TN and AL, the GIS data showed EOL services needed would not be in range for either pt/caregiver to travel. In addition, while it is true HIV need not be a terminal diagnosis, these persons are immunocompromised, have medications with serious side effects, report mental health needs, and develop other chronic health conditions. Social support networks are often limited to one or two trusted others. So this topic, and what happens after this election has very real consequences for people who will need these services. We also found, anecdotally, that many clinicians discourage talk of EOL planning because they fear it will decrease hope in the HIV+ person. This is unfortunate, and nurses should be at the forefront of EOL planning, especially if the ACA goes by the wayside. Thank you so much for your comments. Your message resonates with me tremendously as I have worked closely with the HIV+ population and LGBTQA+ population in the rural Florida Keys for many years, first as a CNA and later as an RN. Those experiences have informed my desire to conduct EOL and ACP research as my personal experiences echo the observations from your study. I wholeheartedly agree that nurses, especially community-health nurses, are uniquely positioned to develop a trusting relationship that could support ACP and make a real difference in improving their rates. This article is scary to me, especially the question #1. “Will history repeat itself if the ACA is repealed and will we go back to the prior health delivery system in the United States or will this be an opportunity to revamp the ACA into a model that meets the needs of all Americans—especially those at the EOL?” History repeating itself to me is; no longer having the pre-existing condition clause, no longer having well visits paid for and having a company of people who are not medically trained decide medical and make end of life decisions. I remember the days when if you had a chronic illness that was costly insurers would refuse you and if they took you there was a cap on how much they would pay. I just saw Kellyann Conway on TV this morning talking about the “great” (her words not mine) plan Trump has that includes a waiver system. Once you’re out of waivers, you’re out of insurance.